Indoor-outdoor pools, hot tubs, saunas. Tofte. Bluefin Bay *Premium Home* 14B ...end-unit half of 14 - wet bar, deck, 2-person jetted tub, HD tv, plus AC. AT THE PIER, CABIN COZY. HAPPINESS HINT: This *Premium Home* is quite unlike any other Bluefin unit. Independent owner control keeps it fresh, pleasantly different & spiffed to Nth degree. Owners give valuable Guest Appreciation coupons to boot. Gorgeous views of the Tofte Dock are yours to enjoy from your balcony at Bluefin Bay 14B. 14B is a two bedroom, one bathroom unit with a kitchenette and lake-facing balcony. Bluefin Bay 14B is a luxury upper level unit at the Bluefin Bay Resort in Tofte, MN. Walk right down to the water`s edge on the shared ledge rock shoreline. The master bedroom has a queen sized bed, sitting area, desk, mini bar, and spectacular Lake Superior views that you can enjoy from every corner of the room. Lie in bed and watch the sun rise over Lake Superior. This unit does not have a kitchen, but has a mini bar/kitchenette great for late night snacks and drinks. Sit back in the sitting area with the windows open and read a book with the sounds of the waves rolling in. Lay back and relax in Bluefin Bay 14B. The guest bedroom also has a queen sized bed. The bathroom features a spacious vanity and large jetted tub. Relax your worries and cares away with a warm tub after a day of exploring the North Shore. There`s seating for three on the lake-facing balcony. Enjoy a cup of coffee and relax while listening to the waves roll in off Lake Superior on the balcony. Sweeping 180 degree views of Lake Superior greet you. luefin Bay 14B is located on the upper level in a building located near the restaurant and indoor pool. There is a playground and even a soccer field you can enjoy during your stay. Light a fire in the community firepit and roast marshmallows. 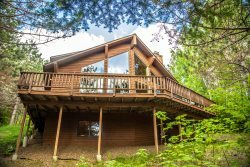 Clearwater Castle is a spacious vacation rental home on the shores of Clearwater Lake. HIGHLIGHTS: Now you can enjoy top-drawer *Premium Home* comforts AND Bluefin Bay Resort ambience – in the same vacation stay. Overview - 14B has 2 queen bedrooms, wet bar (microwave and fridge), 2-person whirlpool, deck, plus air conditioning. (See 14A for kitchen, living/dining great room, fireplace, 2 luxurious extra-long twin beds in private loft, sofabed, separate deck.) Specially priced direct-from-owner, thanks to independent owner control (no resort fee). Resort's indoor/outdoor pools & hot-tubs included. Uniquely decorated & furnished with owners' personal touch. Just steps from the rocky shoreline. Guest Appreciation Coupons included (first-time guests get $25 or $35 for 3 nights, increasing nightly to $185 or $270 6 nights; return guests get $65 or $95 for 3 nights, increasing nightly to $350 or $270 6 nights; possibly less if booked under specials); each additional night brings exponentially increased $$. See ** for Coupon example. Coupons good for bikes, canoes, kayaks, golf, off-site spa services & charter fishing; fine dining; shopping; & in season skis, boards, snowshoes and more. REST OF THE STORY: Home 14B is ‘end-unit half’ of home 14 (one of only 3 *Premium Homes* at Resort). 14B is somewhat comparable in size, but higher value, to a style Bluefin Bay Resort’s system labels “Dockside Guestroom.” But it definitely has a guest-friendly "look & feel" of its own. Custom locally-made furniture through-out for nice fit, unique styling. Lake & Historic Tofte Pier, stone's throw away. Or lounge on deck & relish sounds of waves. 2 ceiling fans. New AC. 2 HD TVs. Freshly remodeled, top to bottom. Amenities galore: Famous Keurig single-cup-perfect coffee. Famous K-cup flavors, all you want. World-class sachet teas & hot cocoas. Bountiful bedding. Luxurious linens. Surprisingly splendid! Click here to learn some details of what you can expect by renting the 'Bluefin Bay By Owner' way. You'll find answers to questions about how this special rental fits into the Bluefin Bay Resort scene. Click on the link "Bluefin Bay By Owner" to see a larger version of this map. Shows locations of Resort's only 3 *Premium Homes* and local businesses accepting our Guest Appreciation Coupons and some favorite recreational spots. **Click here for a preview look at an example letter and Coupon sheet; tailored example items – matching your actual booked stay – will be mailed to you upon receipt of a deposit, time permitting. Your actual Coupons will be in a Check-In Packet for you. Linens, etc. provided, of course - triple-sheeting & all the good stuff! This stay was with a toddler, and it suited our needs well. Playground and pool access was close at hand. Clean, well maintained. Bathtub could use handrails for stability although the tub was a lovely asset. Kitchenette was tiny, but well organized and coffee/tea plentiful. Please provide bowls and plastic ware! A shout out to Marco, maintenance, who easily dealt with 2 issues we had. No physical contact but the emails were very helpful. The town home was lovely. It was a great location with wonderful views of the lake. Very nice, appreciated the hot drinks and bath toiletries. Also the facilities and restaurant at Bluefin. We loved the location; right on the lake. Also it was close to Grand Marais, Lutsen, and many great waterfalls. We also used to bike trail and like the easy access to it. The home itself was fabulous! Clean and everything looked new. The blinds on the windows were terrific. Very nice! Location was great with the lakeside view. Parking was limited and tight, but ok. Somehow I thought the unit we rented was two bedrooms and two baths, so that was a bit disappointing for two couples. The supply of towels and linens was great. Our friends loved your K-cup coffee and the convenience. It was very close to the meeting room where are group met on Friday night. The Coho Cafe was a great breakfast spot with very good service. We loved the rental. Beautiful view of Lake Superior.